This season for New York Fashion Week I had the tremendous honor of getting an Old Hollywood Ombre makeover by legendary Celebrity stylist Adam Livermore at Muze Salon in New York. Adam was highly recommended by my good friend Stephen Marinaro, ‘TheSalonGuy’. You can imagine my excitement when I heard back that Adam would be willing to take the time out of his busy schedule to collaborate with me for this special feature! In ten short years, Adam Livermore has become a driving force in the hairdressing industry. After working behind the chair as a master stylist and education director at Spalon Montage in Minneapolis, and as an educator with Wella Professionals and Kevin Murphy, Adam relocated to New York City and began traveling the world as an educator with Oribe Haircare, and working side by side with Oribe himself behind the scenes at fashion shows in Paris, Milan, and New York. When he's not working behind the chair at Muze Salon in New York City, or working on the education platform, Adam is collaborating with top photographers to create inspiring new imagery. His creative work has been seen in countless magazines, including Vanity Fair, Elle Asia, Beauty Launchpad, Modern Salon, American Salon, Creem, and Ozon. I was both excited and nervous to meet Adam as he’s worked with the world’s biggest celebrities and style icons like Tilda Swinton, Naomi Campbell, Molly Sims, Jake Gyllenhaal, Meg Ryan, and Cher. When I arrived at Muze Salon, Adam greeted me with such kindness. I was completely blown away by how humble he was despite his tremendous successes. We sat down and chatted about my new look for New York Fashion Week. I wanted to still continue on with the ombre trend but this time with an old Hollywood spin. The above photo is a before look at my hair. I was given a menu of complimentary drink options to chose from. The selection included everything from coffee, tea, soda, juice and even wine. I couldn't help but be inquisitive of his technique and learn more about the fabulous Oribe hair care products he was using on my hair. What is your secret to making my ombre look so amazing? Adam Livermore: The secret to a real ombre is to create a design thats all dark at the roots, gracefully transitions to all light at the ends, and is beautifully rich all the way through. Lots of people try to fake an ombre look by packing in highlights or blonde extensions onto the back of the head and just letting the roots come in, but it's just not the same. I love that you teased the hair on top when applying color for the ombre. What’s the reasoning behind that? Adam Livermore: I teased the roots before hand painting the color on your hair because it scatters the individual hair strands a little bit, which makes the transition from dark to light in the finished result more graceful. You did a dry cut on my hair post color. Do you prefer dry cut vs. wet? Adam Livermore: I like both. While both are very technical, wet cutting is more "academic" and dry cutting is more visual. I like dry cutting because I like to see whats happening in real-time while I'm cutting, and clients do too. Even if I get the basic structure of the cut in while the hair is wet, I always do a lot of tailoring when its blown out and styled. The 3 step regime you did to style my hair included Oribe haircare products Supershine, Royal Blowout Spray and Soft Lacquer Heat Styling Hair Spray. Can you describe the styling steps? Adam Livermore: You'll apply Supershine Moisturizing Creme generously on your blonde ends to keep them supple and hydrated, and then Royal Blowout Spray all through your lengths for gloss, heat protection, and smoothness. Then blow it out, and you'll use the Soft Lacquer Heat Styling Spray section by section with your curling iron or flat iron for another layer of heat protection, and for added gloss and memory. Which Oribe products do you recommend to keep my hair looking fabulous post salon visit? Adam Livermore: Oribe Shampoo and Conditioner for Beautiful Color, and the Masque for Beautiful Color are perfect for you! They have a mix of sunscreens and antioxidants to keep your color protected, and they're paraben and sodium chloride free. And the Masque has the mix of proteins and lipids that your blonde ends need most. Aside from ombre what are the hottest trends for hair right now? Adam Livermore: We're seeing a lot of bright colors now... fluorescent yellow and green, lavender, teal. A really fresh way to do an ombre on chocolate brown hair is to make the ends lavender or turquoise instead of blonde. It's a way of looking at your hair more as a fashion accessory, and it helps you think about what colors look best on you. I know you also teach classes for Oribe. What’s your upcoming schedule? Adam Livermore: I teach all the time... every month I'm out on the road in our Oribe Haircare salons teaching our stylists the latest techniques. 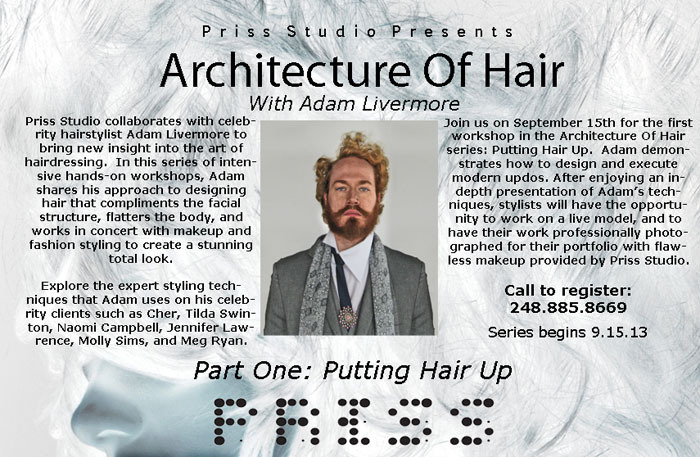 I'm teaching a series of hair styling classes starting next month in Detroit, hosted by Priss Studio, and its open to absolutely anyone who wants to come in and learn the techniques that I use on my celebrity clients. It's going to be incredible and I'm so excited about it. Thank you so much Adam for letting me be your 'Muze' and creating the most epic Old Hollywood Ombre for New York Fashion Week!